The Gods are smiling on us. The good news continues to come to Upshur Street and this time on the eastern end near the Old Soldiers Home across the street from the Hitching Post. 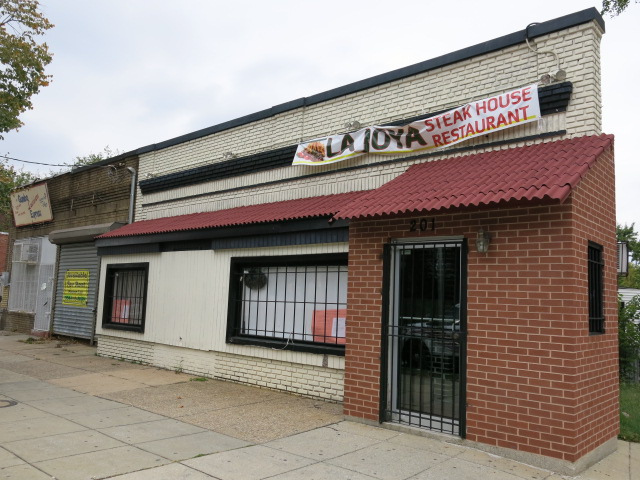 201 Upshur Street, NW is the former home to El Limeno and briefly La Joya Steakhouse. Now – J ‘n G Tavern is coming!!! Why three exclamation points? The J and G stand for Jackie and Gordon – the owners of Bar Charley (Dupont), El Chucho (Columbia Heights), Jackie’s and Quarry House (Silver Spring) and the future Little Coco’s (Columbia Heights/14th St Heights/Petworth). And it’s going to be a real deal casual neighborhood corner tavern!! And there will be a heavy food focus on good burgers!! And it’ll be kid friendly in the early hours (with a small kids menu)!! And it will be casual – read – reasonably priced and accessible to everyone in the neighborhood!! And there will be 16 draft beer lines!! Ok ok you know I get excited easily but I’ll calm down a bit. In addition to 16 draft lines there will be 50-60 more beers available in bottles and cans. There will be over 100 bourbons and rye whiskeys. And because the space was previously a restaurant – they’ll be ready to open in April!! Ed. Note: For those curious about the status of the coming Italian/pizza tavern, Little Coco’s, in the former Rib Pit Lounge space – it should be ready around late Summer.